Courses in the Targeted category vary from year to year. Training is designed to meet the direct needs of the municipalities. 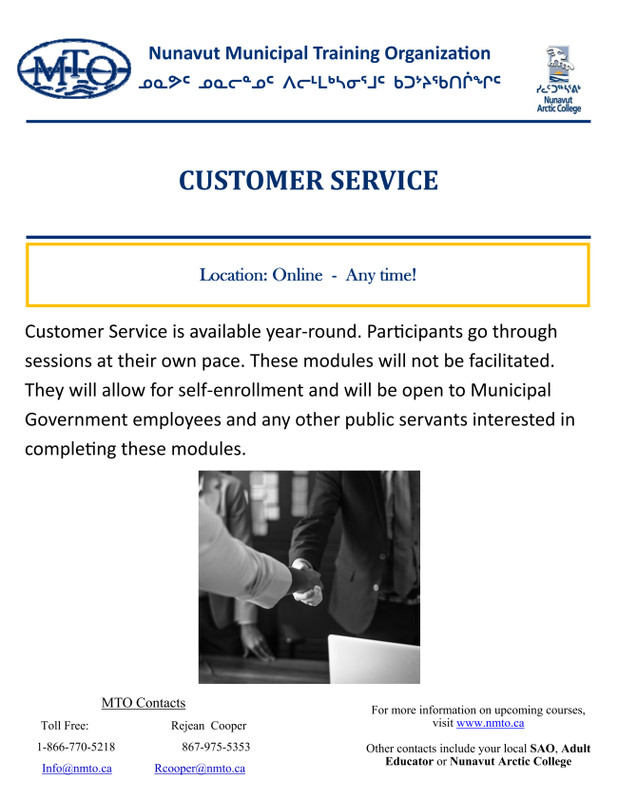 The specific needs are identified through the MTO’s annual Training Needs Survey, a detailed analysis of previous years’ deliveries, and through direct requests from the municipalities themselves as the year progresses. Occasionally the MTO is asked to conduct training by a partner and should the partner contribute the entire costs of this training, the MTO will be able to accommodate the requests. This categotry of training requires the flexibility to respond directly to the pulse of the community. This course is design to give an overview of AutoCAD for Nunavut Planning and Lands administrators. 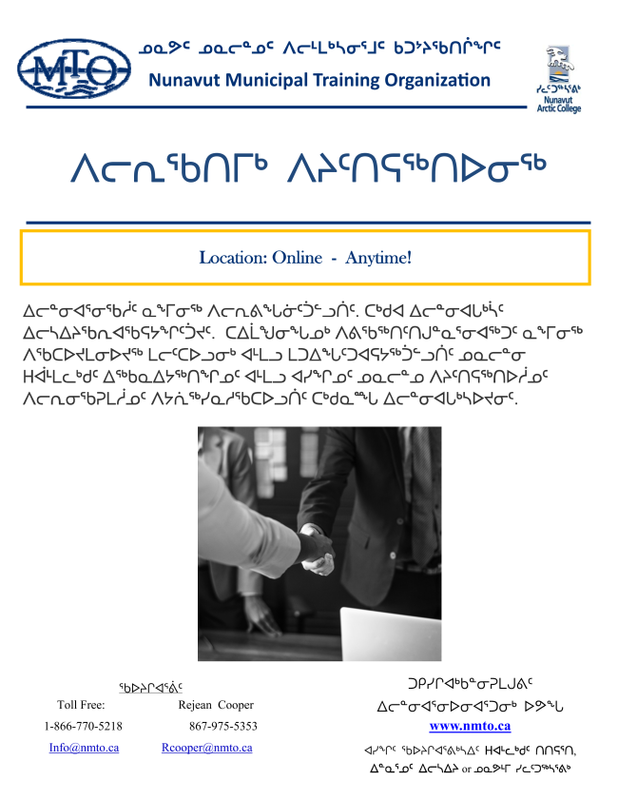 This training will take place in Rankin Inlet. This workshop is focused on the introduction of best practices, modern techniques and established strategies to improve the process of business or professional writing, Overall, the result is a more professional and polished product: written documents aligned to your readers’ needs. Confined and restricted spaces are work areas which are not intended for continuous occupancy, and which have by design, limited or restricted entry or exit. Confined Space Entry Hazard Awareness trains personnel to recognize hazards of working in a confined or restricted space and to carry out confined space entry and attendant duties safely. The City of Iqaluit will conduct a one-day training session on the proper dilution, distribution methods and handling of Calcium Chloride, as part of the Nunavut Municipalities methods for dust suppression. Location: City Garage, Federal Road. Professional Drivers’ Upgrading delivered in partnership with the Alberta Motor Association. Training and certification were provided in: safe performance backing procedures, vehicle handling & control, observance of rules & regulations, defensiveness & planning, and general skills. This 2-day course provides Facility Operators the opportunity to develop and enhance their skills and abilities in areas that will benefit themselves, their employer (hamlet), their career and the facility they operate. This training is intended to meet the need for trained operators and efficient operation of swimming pool facilities. Municipal Solid Waste Management Phase 2 will take the participant further into the best practices of Landfill Mangement; Hazardous Waste Managment; Waste Segregations and storage methods, Occupational health and safery; Land Fill Fires ( causes, prevention and Emergency responses; and the NWB water License reporting requirements. 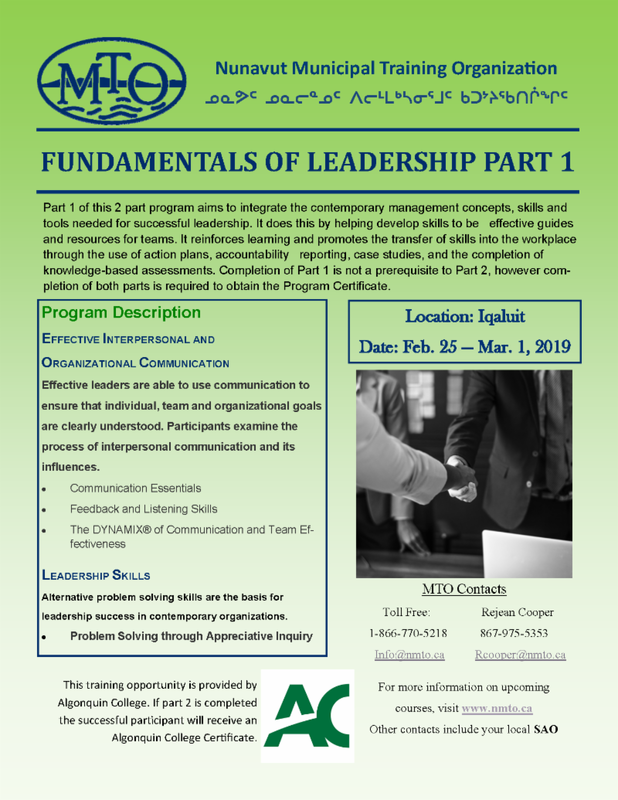 Participants will gain hands on experience on the this 3 day seminar, with spending 1 full day in a Land fill operation and working with consultants and community peers on best practices methods. GIS is about modeling and describing our world into two ways, either Spatial (Locational Data) or Non-Spatial (Attribute Data). City of Iqaluit, many departments of Government of Nunavut and Federal Government are known for using GIS. The 5 day Recreation Facility Operators Course will cover 3 basic needs for Facility grassroots workers. The first is for Arena Maintenance including ice painting, the second component will be Life Cycle Risk Management, understanding the life cycle of your facility and identifying and dealing with risk issues, then it will finish up with a 2 day workshop on Supervisory Skills, where participants will understand managing yourself, managing work, managing people and managing situations.